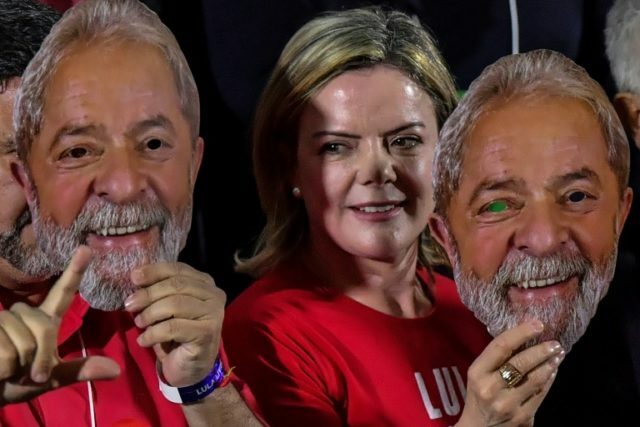 Rio de Janeiro (AFP) – Luiz Inacio Lula da Silva may be incarcerated and potentially prevented from standing in October’s presidential election but the leftist leader’s advantage in polls continues to grow. Figures published by pollsters Datafolha on Wednesday showed the former president’s share of the vote has risen to 39 percent from 30 last month. It means he now has more than double the number of his nearest challenger, right wing candidate Jair Bolsonaro, who is up to 19 percent from 17 last month. None of the other 11 registered candidates polled double figures in the sample of almost 8,500 people asked who they intended to vote for in the October 7 election. The figures were in line with other polling organizations that gave Lula a 37 percent share earlier this week. The 72-year-old leader of the Workers’ Party (PT) is aiming for a third term in the top job having led Brazil from 2003 to 2010. But Lula could be barred from running as he serves a 12-year sentence for corruption. Last week, Brazil’s Attorney General Raquel Dodge asked the country’s top court for electoral matters to invalidate Lula’s candidacy. Brazil is technically obliged to abide by the committee’s findings. In Brazil’s presidential election system, the top two candidates from the first round head to a second round run-off, with Datafolha putting Lula ahead of Bolsonaro by 52 to 32 in that vote.